If you're not aware, Dots is the incredibly addicting iPhone game from Betaworks that is one of the most popular free apps since launching in May. It's also ridiculously simple. You connect dots. That's it. As I told Brian Ries of Daily Beast/Newsweek, a lot of life is about connecting dots anyway, so that's one reason I think it's a popular game. As you connect dots, a new wave of dots slides down the screen. They're multi-colored and you connect dots with like colors. 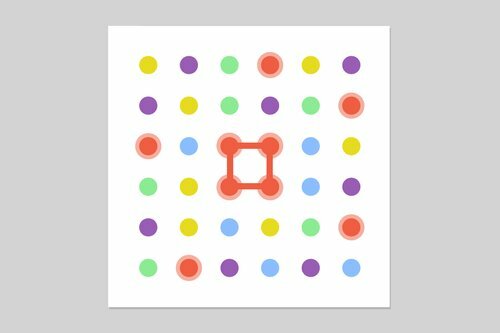 As Quartz's Zach Seward points out in this excellent Dots strategy guide, the key to the game is making squares. And that's correct. Don't stress about rectangles, or even straight lines. Do whatever it takes to create squares. There are many ways to make squares. Seward talks about all of them here so I'm not going to be repetitive. Now, for the real power users, here are some pro tips to beat your friends. And why am I sharing these tips you might ask? Well, first, Seward himself encouraged me to do such a post. But also, Dots is just way more fun when your friends are competitive with you. There's a desire to beat them. I actually want my friends to beat my high score and keep the competition going. (1) Relax. Play when you're relaxed. I mean 100 percent relaxed. Betaworks' Patrick Moberg said the game was created for a "Zen-like" experience. But it's easy to get frustrated or stressed. Don't. It's just a game. And also, you'll do better when you're relaxed. (2) Focus. Don't have distractions around you. Don't be thinking about anything but the dots before you. Focus 100 percent and you'll do better. Probably seems like common sense, but it's so important. (3) Anticipate. This is huge. I wasn't very good at this when I first started playing Dots, but a huge skill to be successful in the game is anticipation. Know where the Dots will fall next before they even fall. Eye the board in a way you know that if you make a square here, these other dots will make a square too, and do them in quick succession. Similarly, if you get rid of this dot, these dots line up just right and so do those over there. (4) Strategize. Be strategic in every move. Don't waste power-ups. You can accomplish way more without the power-ups than you think. In fact, my best games only use 15-20 power-ups tops. That includes the extra 5 second power up, which you must use for a really great high score. That said, when you see no square opportunities, you must use power-ups or start a new game. Otherwise you'll just waste your time. (5) See. You have to really see the board at all times. And this includes peripheral vision. It's not easy to see the whole board at once. I usually focus on the bottom of the board as I play Dots. But I must be able to see opportunities at the top too. While I focus on the bottom, my peripheral vision eyes opportunities up above. Then I might focus on above for a bit, and watch for opportunities below at the corner of my eye. This may sound crazy but it's important. (6) Act. You can't hesitate in Dots. Not if you want a high score. Just keep going. Tell yourself, keep going. Stay positive. Opportunities will present themselves. In fact, sometimes a board looks hopeless until you land a single square that opens up two or three square opportunities simultaneously. If there's a single square, there's going to be others. (7) Hustle. And this goes without saying, but speed is so important in Dots. To get a 700, or even a 600, in Dots, I can tell you, you must have a nearly flawless game with square, after square, after square. And you have to do it quickly. The highest score ever is 800 so 600 or 700 is quite good. Even 500 is a huge milestone. Huge. If you're in the 400 range or lower, don't worry. You can improve the score. But speed will be part of it. BONUS: One of the best things about Dots is if you're having a terrible game, don't waste your life, quit it midway and start another one. Any dots you managed during that game still count toward power-ups, so all is not lost. Hope these help! Happy dotting.